I have been looking forward to this trip because the places we will spend time in are new ones for us. We are near the end of our sojourn in Istanbul so the idea of being here has been replaced with a week of experiencing sounds, sights, smells, tastes and feel. One thing I hadn't prepared myself for was the sheer size of the population. We have wondered out loud a few times why the streets seemed to always be full of people. Yesterday we boarded a ferry for an hour plus journey to Buyukada, one of the Princes Islands to the south. We were dumbstruck by how the city on the Asian side of the Bosphorus seemed to go on and on, a seemingly endless supply of apartment buildings. I pulled out phone and discovered via Wikipedia that Istanbul's population is 13.6 million. That is one big town. 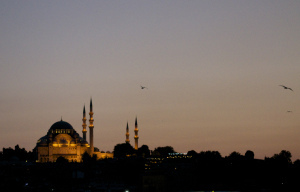 OK, so I confess that my impression of Istanbul had been flavored by Hollywood. Liam Neeson thrillers paint the city in sweltering light orange tones, with a sense of mystery lurking up each side alley you pass. Truth is this is not far from what we have experienced - minus the kidnapping. Istanbul is truly exotic. The mix of east and west is palpable. The number of lane ways with eating houses and little shops where cars, scooters and pedestrians all share the roughly cobbled street defies imagination. We have been riding the tramway/light rail, but as far as we can tell there is no train network. The trams only service the old city (Saltanahmet) and central areas, so I can't imagine how difficult it must be to transverse the City in the suburbs. So we have sampled Istanbul and its hospitable people. Perhaps if you had lived here all your life you would know only a fraction of what this place offers. We have been here just 1 intoxicating week, seeing only a small bit of the history and culture. But it has been a week well spent.